This league will be taking the place of the NBA in this timeline. It will begin in 1949, a few years after World War II (and when the NBA went under due to financial issues). - October, 1948: Roger Dobrinski, Harold Cooper, and Jack Furlow announce they wish to start a new basketball league, the BAA, and are looking for bids from cities and owners. - December, 1948: The 3 announce that they have received close to a dozen bids from cities in primarily the eastern United States. They also announce there will be 8 bids chosen for the inaugural year of the BAA. - July, 1949: Columbus, Pittsburgh, Washington D.C., Richmond, Savannah, Jacksonville, Louisville, and Nashville are announced as the BAA charter markets. The Cardinals are owned by Harold Cooper. Furlow and Dobrinski (the other two founders) are set to serve as Co-Commissioners of the BAA. Cooper is a quiet man who enjoys bird-watching in his free time, often traveling around North America in order to view various rare species of birds. He chose the Cardinal to represent one of his first favorite birds, and his home state of Ohio. The Cardinals will start off playing their games in St. John Arena (shared with Ohio State Basketball). Cooper plans to have a new, larger arena built by 1960. Columbus' logo is a simple C with a crest of a cardinal topping it off. Both uniforms use a script (Cardinals on the home, Columbus on the away) and a simplistic design with no flashy elements. The BAA logo seems to be way ahead of its time. The uniforms are very, very plain. I mean, I get that they would be plainer than today in 1949, but not this plain. A contrasting waistband and striping around the hems of the shorts would do wonders. It's also odd that the C logo is nowhere to be found. Putting it on the sides of the shorts would tie everything together nicely. Thanks for the feedback, I went back and added the logo to the shorts and a contrasting waistband. I agree, before I read the post and I’d only seen the logo, I thought it was a rival league from the 80s/90s. The ball flying through the “BAA” just seems a bit futuristic for the time. I removed the flying ball so the logo is now just the BAA text between two red lines. The flying ball will most likely return in a few decades. Or maybe you could borrow this and have it be a "retroactive" logo created years after the fact. The Yardbirds are owned my Mitch McGraw, a Georgian peanut farming kingpin. His peanut company is said to supply more than half of the country's peanuts. McGraw decided to name his team the "Yardbirds" due to Georgia's history during the 13 colonies. It was where the British sent their prisoners, and a yardbird is slang for an inmate. He also wants to inspire a rough and touch attitude for his team. Georgia will play in the newly constructed SPC (Savannah Peanut Company) Fieldhouse. 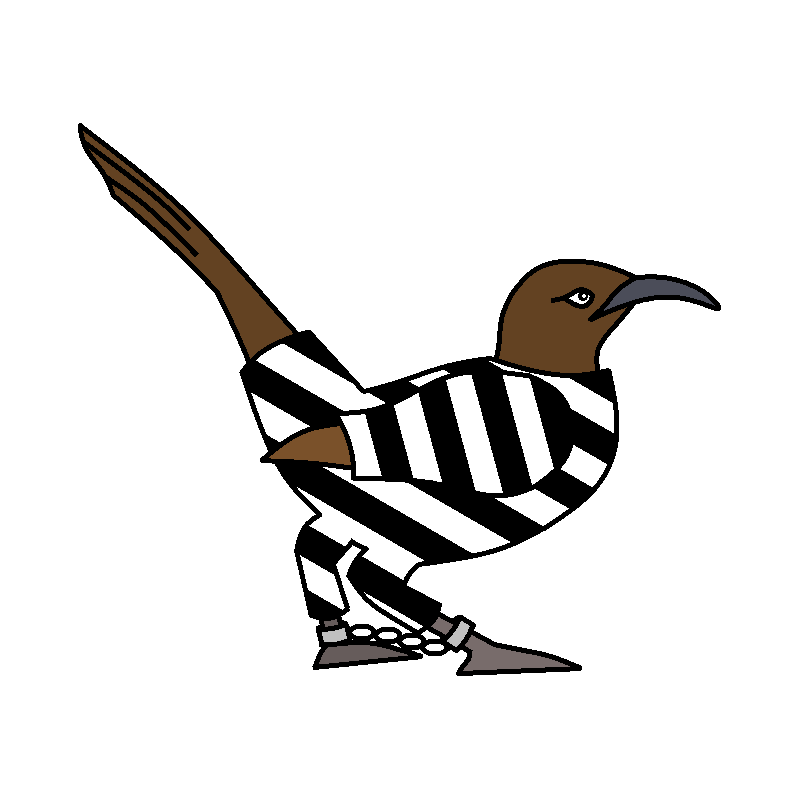 A Thrasher (Georgia's State Bird) wearing a black and white striped prison suit. 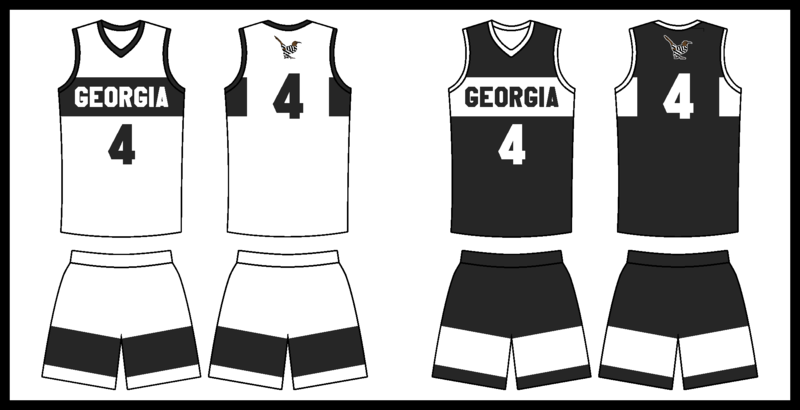 They use a stripe with "GEORGIA" in block lettering inside, as well as a stripe on the shorts. The team's bird logo sits above the number below the back collar. The actual jerseys are black, but I used dark grey here so you can still see the outlines of the template. C&C is encouraged and appreciated! The next team will be up later tonight. I love the yardbird's look. I hope their fans end up being the rowdiest in the league and the SPC Fieldhouse becomes "the big house." Nice start. We don't get many basketball leagues around here. Excited to see how this develops. I like the cardinal "C" though it could also be mistaken for a shark fin or it also kind of reminded me of a backwards hurricane icon. I'd explore adding one other vague piece of bird anatomy to really sell it. The Yardbirds logo is nice. I can imagine them becoming an iconic team that weathers plenty of PC storms in later years. 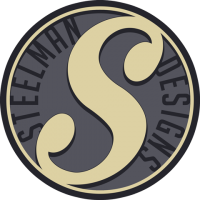 I think what is causing the modern look for the league logo is the squared edges and lines of the font. I like the ball through the letters look a lot, but a font more grounded in the 50's would probably do wonders. Then the ball through the letters can be upgraded through each era. Only other thing I'd recommend is to make sure your posts are properly spell-checked, I noticed a few errors. Thanks, I was deciding between a basketball and a football league, but decided on basketball because of the lack of one on here. As for the Cards' logo - I agree it could look like a shark fin or something else to some. A couple years from now they will probably make a slight change. Thanks, that's a really good idea. Something I'll definitely have to incorporate down the line. I can just see the Yardbirds relocating to Atlanta. The Danes are owned by Georgie Johnson, CEO of a local mining company. He played college basketball at the University of Pittsburgh (1934-1938), and is now a large donor to their basketball program. Johnson named the Danes after Pennsylvania's state dog, the Great Dane... which he owns 3 of. The Danes will play at Pitt Pavilion, home of the University of Pittsburgh Panthers. 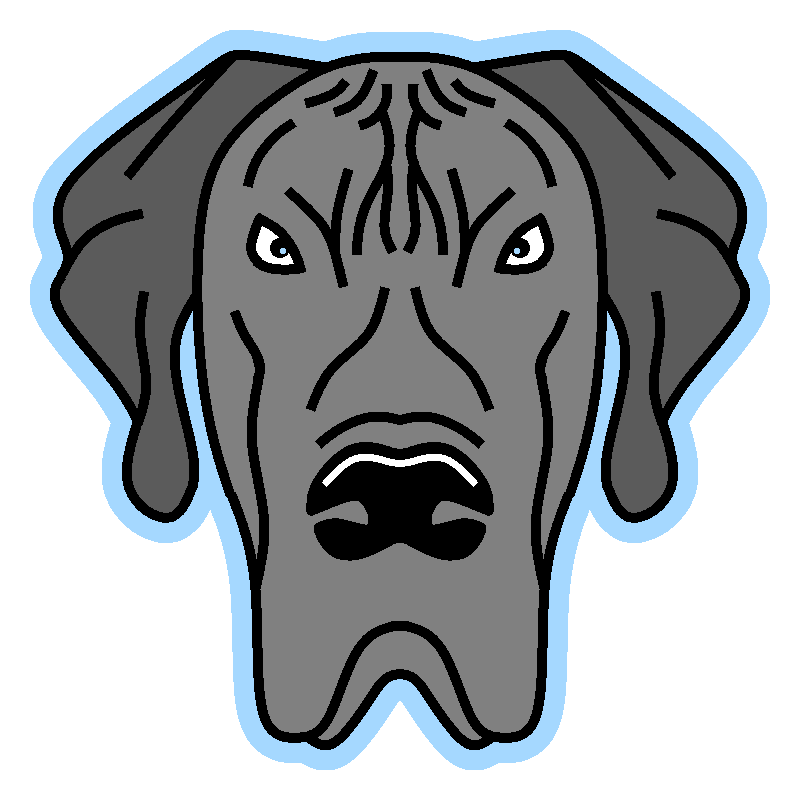 A front-view of a Danes face, with a light blue outline. 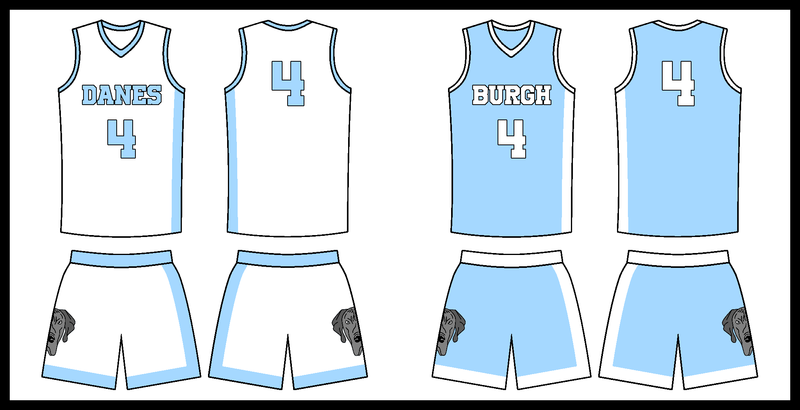 The home uniforms says "DANES" in light blue text while the away says "BURGH." Both have a stripe running down the left side of the uniform, and the team's logo on the right side of the shorts. C&C is encouraged and appreciated! Hopefully I'll be able to post a few more teams tomorrow. Well it he put "Pitts" on there the Danes would get called the Arm-Pitts. 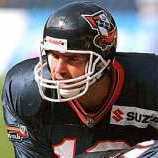 Clearly, you've never met Orlando Predators fans. Quite a proud fanbase they are. Also so far I am liking the series. Keep it up!